The euphoria and pain of childbirth has worn away and you start wanderlusting again. Is it possible to travel with your baby? You’re probably a little freaked out, scared, and maybe a little too drained to care. But, you still wonder is travelling with your baby possible, easy, too-hard basket, or just a ridiculous daydream. I have sooo many new mothers (or even those who haven’t had kids yet) tell me they can’t travel with a baby. My response is always – yes you can. In fact, its one of the easiest ages to travel with kids! I know it sounds hard with all that nappy (diaper) changing and feeding and sleep routines. But, babies can be so darn good at slipping into your life. 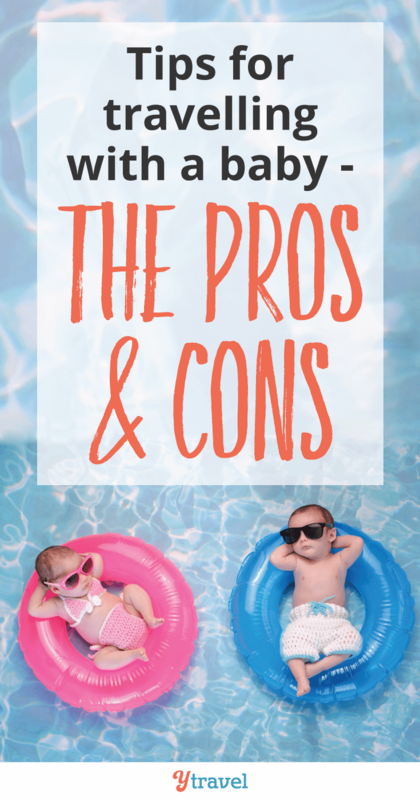 Over the next couple of weeks, we’ll be sharing posts on the pros and cons of traveling with kids at various ages. I’m asked all the time, and I only have limited experience to the age of 8. I’ve been traveling with both my girls since they were born so can give you experienced advice up until 8. 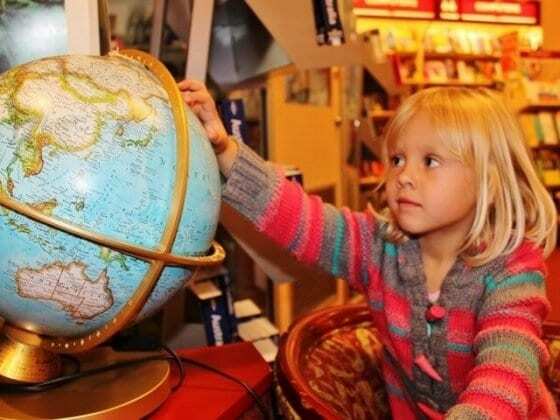 I’ve called on some family travel experts to offer some extra insights and tips to fill in the gaps. My belief is that parenting is hard no matter the age, nor where you are, so you might as well travel and fill up the moments in between with meaningful memories. you can make it work and enrich your family life in doing so. If you love the post, please pin it! Kalyra was only a newborn when she had her first flight for domestic travel -possibly only a month or so old. (I can’t remember – baby brain!) 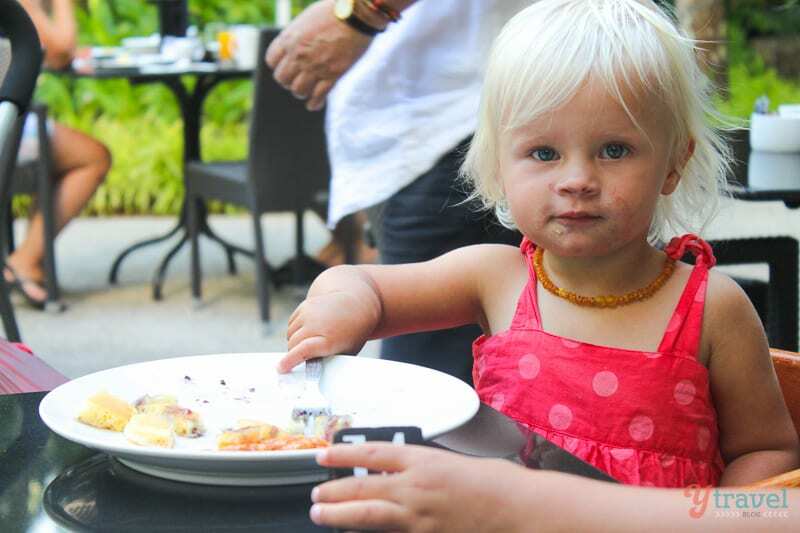 She was six months old for her first international trip to Fiji for a friend’s wedding and staying at a resort. She’s been a breeze to travel with ever since. It’s so worth training them from an early age. 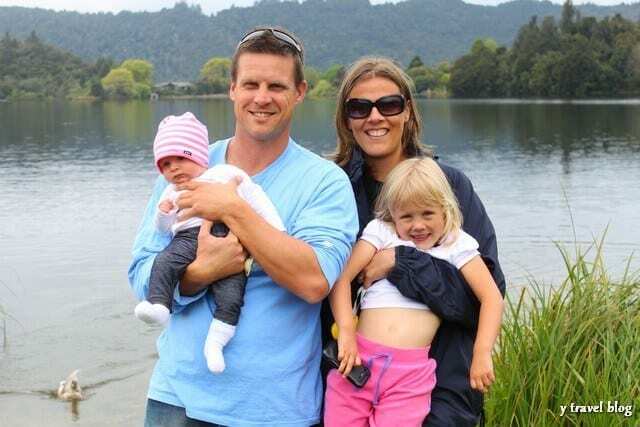 Savannah was six weeks for her first domestic travel and was eight weeks old for her first overseas trip to New Zealand for a short road trip on the north island. As you can see, our destination choices for traveling with a baby are not too intense. Both girls had their first major outing at 4 days old. Kalyra to a conference with me, Savannah to Taronga Zoo. Everyone thought we were mad, but I felt fine and the girls loved being snuggled up to me all day and being adored by everyone walking past. It’s important to consider your personality. If you’re anxious, structured, extra cautious, then it might not be a great idea for you to travel with a baby. Perhaps start off slow, with short trips away so you can test it. The last thing you want to do is put time, energy and money into a travel experience and hate it. They may all seem so snuggly and cute, but every baby has their own personality. You’ll get to know yours pretty quick. If you feel they have a relaxed temperament and love to hang out with you all day, then travel may work well for them. If they’re a bit cranky and love a bit of structure and routine they may not be so suited. Sometimes the only way to find out is to give it a go. You won’t ruin them in doing so. It’s not a great idea to travel with a baby if you, or they aren’t in optimal health. I mean outside of sleep deprivation. If everything else is going okay, then you’re good to go. For tired parents, consider the style you travel in. You may want to opt for organised tours, resort stays and easy maintenance travel. It all depends on what you feel you can manage. I traveled with my girls when I breastfed and when I bottle fed. Breastfeeding is much easier. Depending on where you are, finding the right formula could be a problem. Research ahead. You can always take your own (although its extra luggage) or travel to those places where you can easily access the formula you require. Here’s a post with useful breastfeeding tips for when you travel. How much luggage are you going to need? You don’t need much room for clothes as they are so small. It’s more for nappies, strollers and baby seats. One reason we love road trips so much is that you can carry more things with you. 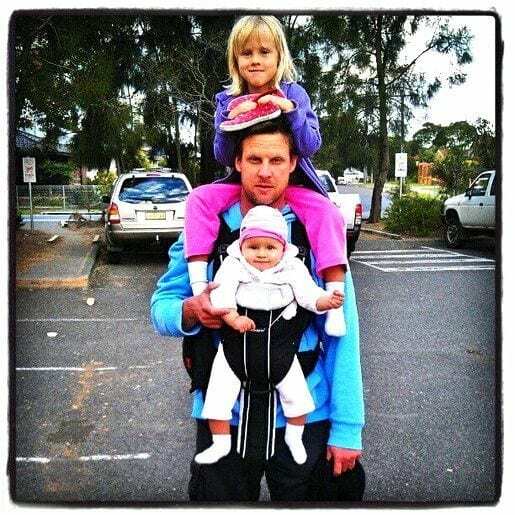 When we traveled to New Zealand with Savannah, our Baby Bjorn saved us from taking our stroller everywhere with us. Savannah loved being carried around in that all day. There’s a lot you’re managing when you travel with a baby. Choose your destination wisely. Some destinations are more ideal for babies than others. Make it as easy on yourself as you can. 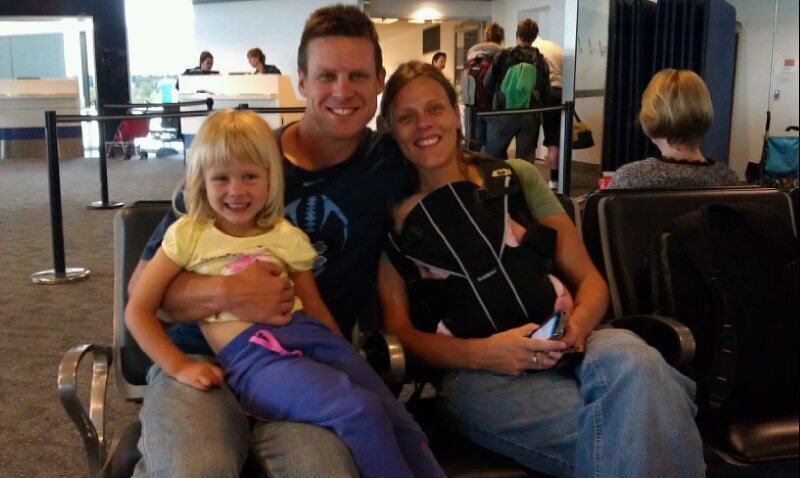 When we had our first son, the thought of traveling with a baby was terrifying! But, we soon got the hang of it and it really is one of the easiest times to travel. They are not mobile, they will sleep in either a stroller or a baby carrier (our first preferred the baby carrier, our second like the stroller). I breastfeed so I didn’t have any worry about food, and we never had to worry about a bed. Baby either slept with us, or in a crib. Nicole Wears from traveling canucks. If they get sick, you’ll freak out. Our boys never slept well in a new environment so we never got as good of a sleep as we do at home (they are better now at 2 and 4). And we always packed a lot of stuff for our babies and we normally used everything we brought, so carry-on luggage is no longer an option. Nicole’s 13 tips for successful baby travel. 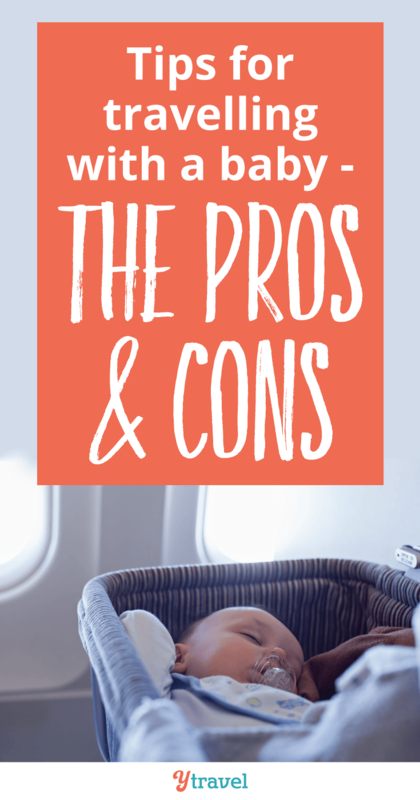 If you have any questions about travelling with a baby, please ask in the comments below, or share what you feel the pros and cons of traveling with a baby are? Oh dear, I do sound a bit negative… but some of our early trips really were a nightmare. It’s easy to say now that I wish I hadn’t travelled with babies, but at the time I was always keen to give it a bash…. All depends on the baby and your tips about knowing yourself are right on the money. Yes I do think it depends a lot on your babies. If your baby is not jiving with the travel experience, there is no point continuing. That becomes hell for everyone. My daughter travelled to 8 countries in her first year, and non of them were resort destinations. Car trip through Jordan, trains around China, the Philippines…. If you are going to be taking time off work for a new born and staying up all night, then you might as well be doing it overseas. This is really difficult, but also rewarding. Having a child has always been my greatest gift and travel with him is a dream for me. I’ve always admired when parents are able to travel successfully with a young child! It seems so difficult and like it presents many unique challenges. This article made me remember the first time I traveled with my son. Rsr .. Today, looking back, I can see how much insecurity and fear I felt and how little I could enjoy that trip along the Brazilian coast. I loved the tips! I wish I had found your blog back then. 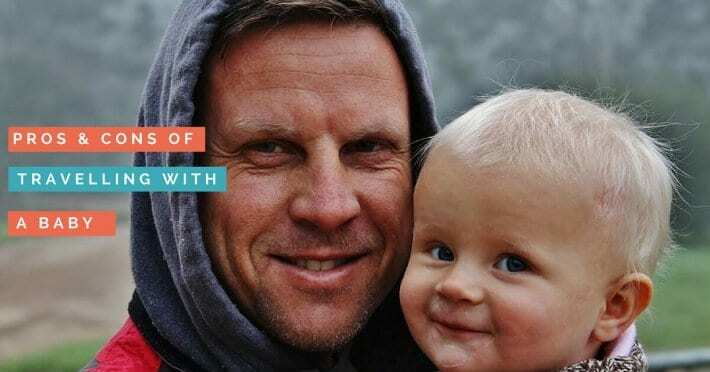 Get the experience for the first-time dads and moms! The pros that you have included may not cause so much difficulties. Because the enjoyment to travel with babies is lot more than the problems. Besides, though if you travel alone problems will occure must. So don’t get harresed to travel with your baby. Just follow some traveling tips with babies and use a stroller. Every thing will be ok! Hi Caz, great tips. However, I don’t think many people will want to travel with their babies when they are still very young. I wouldn’t allow my wife to travel if she is still with a baby that is less than one month old – different stroke for different people. I can see that both Savannah and Kalyra are doing great with your travels and I think they actually love travel – a trait they may have acquired from you and Craig. If I’m going to try this, it would be maybe an emergency or just to challenge myself to do it! Babies definitely vary so much. My baby will not be happy in a carrier. She is only 6 months and already is very demanding. She needs a change of scenary every 5 minutes to keep her entertained. She prefers sleeping in her environment (home) or else she will fight sleep for hours. We will be going on a trip this weekend, and I am hoping that I will be able to keep her both happy and entertained all together. i am the more protective mom and also love to include my baby with all my activities so that she learns at a quick pace. I do not like the idea of leaving my baby in a carrier. Babies are not dolls, they are miniature human beans, observing and capturing every movement trying to fit into an unknown world. Most importanlty, my baby needs to be learning, happy, behaved and loved. Last month, I have traveled with my son, On one hand, it was fun but on other hands, It was challenging to travel with a kid.